Cassie is a lovely 20-year old horse that presented to us with a foul smelling abscess draining from underneath her jaw. A huge amount of very smelly pus was draining from the abscess but Cassie was otherwise bright and happily eating all her food! On examination there was nothing obvious to find apart from a palpable thickening of her lower jaw bone (mandible) on the left hand side associated with the abscess. We suspected that Cassie had an infected tooth root, which is not that uncommon and had probably been developing for a while before bursting out through the bottom of the mandible due to the pressure within an enclosed space of the tooth socket. There were no visible problems on the surface of the teeth in the mouth so we recommended x-rays to have a look at the tooth roots in the area of the abscess. It is very common for horses to have quite nasty dental disease without showing any symptoms, which is probably an adaptation from evolution where, as a prey species, it would be important for them not to show weakness in front of predators so they don’t get targeted. 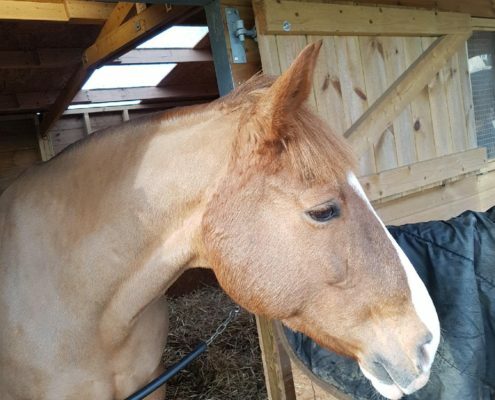 Using our mobile equipment we were able to x-ray her head and teeth in the comfort of her own stable, which revealed a rather surprising finding: Cassie had a fracture of her left mandible. It is unknown what caused this, and amazing she hadn’t shown any symptoms… she is obviously very brave! As she was so well, apart from the pus, we decided to treat her conservatively and gave her a long course of antibiotics, based on the results tests for the type of bacteria present in the pus. Antibiotics reduced the pus, but after several weeks, it had still not cleared up. 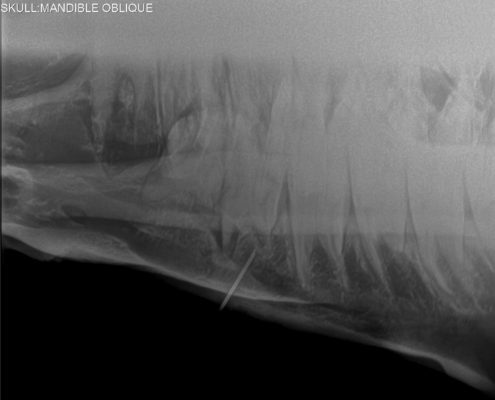 We repeated the x-rays, using a metal object inserted into the draining abscess, to point towards exactly where the pus was coming from. The fracture line passed diagonally through the roots of a few teeth, and the marker pointed towards one of them in particular, so it seemed likely that the fracture had allowed bacteria into the mandibular bone and to the tooth root, which had then resulted in an infected tooth root. We decided that the bone had had long enough to heal and should be stable enough by now to allow extraction of the problem tooth without too high risk of destabilising the fracture. Extraction of horse’s teeth can be very challenging because they go so far back in the mouth, you only have a relatively small mouth to access them through, they have huge long roots and are packed in very tightly. We heavily sedated her in her stable, then blocked the nerve supplying sensation to the lower teeth using local anaesthetic so she didn’t feel anything and carefully extracted the tooth we were suspicious of being infected. Following extraction, the pus reduced and stopped, proving that the tooth we extracted was acting as an ongoing source of infection. Cassie has now fully recovered from her mandibular fracture and her owner is very pleased she is not covered in stinking pus anymore! Cassie is lucky to have such a dedicated and patient owner.